Do I Really Have to Read This Whole Document? kdb+ is the market leading timeseries database from Kx Systems. kdb+ is used predominently in the Financial Services sector to capture, process and analyse billions of records on a daily basis, with Kx counting almost all of the top tier investment banks as customers. kdb+ incorporates a programming language, q, which is known for its performance and expressive power. Given the unsurpassed data management and analytical capabilities of kdb+, the applicability of kdb+ technology extends beyond the financial domain into any sector where rapid pre-built or adhoc analysis of large datasets is required. Other sectors which have good use cases for kdb+ include utilities, pharmaceuticals, telecoms, manufacturing, retail and any sector utilising telemetry or sensor data. AquaQ TorQ is a framework which forms the basis of a production kdb+ system by implementing some core functionality and utilities on top of kdb+, allowing developers to concentrate on the application business logic. We have incorporated as many best practices as possible, with particular focus on performance, process management, diagnostic information, maintainability and extensibility. We have kept the code as readable as possible using descriptive comments, error messages, function names and variable names. Wherever possible, we have tried to avoid re-inventing the wheel and instead have used contributed code from code.kx.com (either directly or modified). All code sections taken from code.kx.com are referenced in this document. Process Management: Each process is given a type and name, and can optionally be given a parent type. By default these are used to determine the code base it loads, the configuration loaded, log file naming and how it reports itself to discovery services. Whenever possible we have tried to ensure that all default behaviour can be overridden at the process type level, and further at the process name level. Code Management: Processes can optionally load common or process type/name specific code bases. All code loading is error trapped. Configuration Management: Configuration scripts can be loaded as standard and with specific process type/name configuration overriding default values. Configuration scripts are loaded in a specific order; default, then parent process type specific (optional), process type specific, then process name specific. Values loaded last will override values loaded previously. 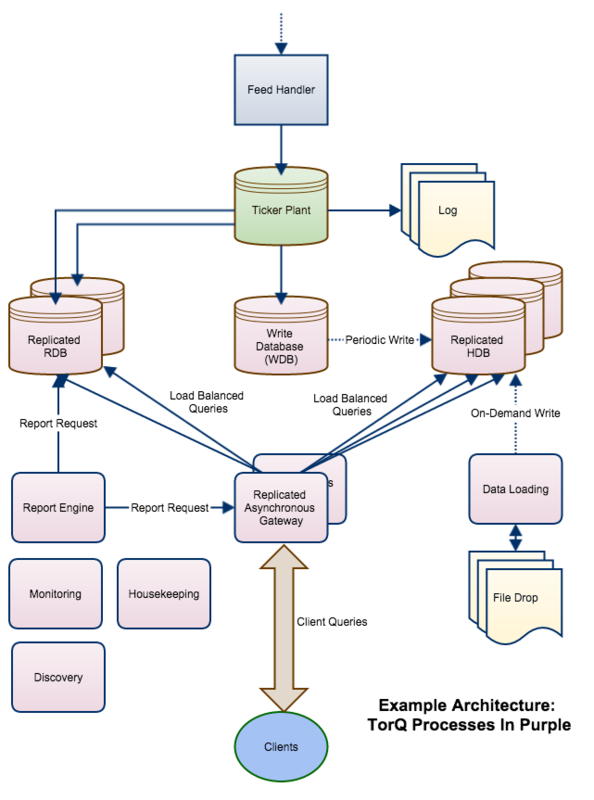 Usage Logging: All process usage is logged to a single text log file and periodically rolled. Logging includes opening/closing of connections, synchronous and asynchronous queries and functions executed on the timer. Logged values include the request, the details of where it came from, the time it was received, the time it took, memory usage before and after, the size of the result set, the status and any error message. Incoming and Outgoing Connection Management: Incoming (client) and outgoing (server) connections are stored and their usage monitored through query counts and total data size counts. Connections are stored and retrieved and can be set to automatically be re-opened as required. The password used for outgoing connections can be overridden at default, parent process type (optional), process type and process name level. Access Controls: Basic access controls are provided, and could be extended. These apply restrictions on the IP addresses of remote connections, the users who can access the process, and the functions that each user can execute. A similar hierarchical approach is used for access control management as for configuration management. Timer Extensions: Mechanism to allow multiple functions to be added to the timer either on a repeating or one-off basis. Multiple re-scheduling algorithms supplied for repeating timers. Standard Out/Error Logging: Functions to print formatted messages to standard out and error. Hooks are provided to extend these as required, e.g. publication to centralised logging database. Standard out and error are redirected to appropriately named, timestamped and aliased log files, which are periodically rolled. Error Handling: Different failure options are supplied in case code fails to load; either exit upon failure, stop at the point of failure or trap and continue. Visualisation: Utilities to ease GUI development using websockets and HTML5. Documentation and Development Tools: Functionality to document the system is built into AquaQ TorQ, and can be accessed directly from every q session. Developers can extend the documentation as they add new functions. Functionality for searching for functions and variables by name and definition is provided, and for ordering variables by memory usage. The standard help.q from code.kx is also included. Compression: allows compression of a database. This can be performed using a set of parameters for the entire database, but also gives the flexibilty of compressing user-specified tables and/or columns of those tables with different parameters if required, and also offers decompression. Gateway: A fully synchronous and asynchronous gateway is provided. 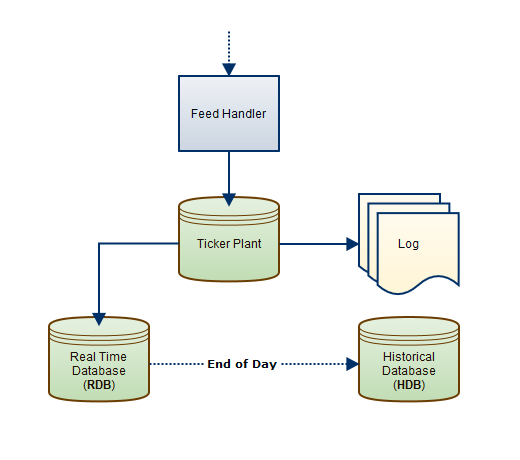 Real Time Database (RDB): A customized version of the kdb+tick RDB, to allow dynamic tickerplant subscriptions, reloading of multiple HDBs using authenticated connections, and customized end-of-day save downs. The RDB, WDB and tickerplant log replay share a common code base to ensure that a save-down modification to a table is applied across each of these processes. Reporter: The Reporter Process runs defined reports (q queries or parameterized functions) against specific database or gateways on a schedule. The results are retrieved and processed. Processing can be user defined, or can be a standard operation such as writing the data to disk, or emailing the results to a list of recipients. This can be useful for running system checks or generating management reports. Housekeeping: A process to undertake housekeeping tasks periodically, such as compressing and removing files that are no longer used. Housekeeping looks up a file of instructions and performs maintenance tasks on directories accordingly. Features allow selective file deletion and zipping according to file age, including a search string parameter and the ability to exclude items from the search. The process can be scheduled, or run immediately from the command line and can be extended as required to incorporate more tasks. File Alerter: A process to periodically scan a set of directories and execute a function based on the availability of a file. This is useful where files may arrive to the system during the day and must be acted upon (e.g. files are uploaded to a shared directory by users/clients). The functions to execute are defined by the user and the whole process is driven by a csv file detailing the file to search for, the function to execute and, optionally, a directory to move the file to after it has been processed. Kill: A process used to kill other processes, optionally using the Discovery Service to locate them. A common practice is to use a gateway (section gateway) to manage client queries across back-end processes. The gateway can load balance across processes and make failures transparent to the client. If the clients access the gateway with asynchronous calls, then the gateway can serve many requests at once and additionally implement client queuing algorithms. A modified version of the RDB (section sec:rdb) which does different operations at end-of-day, reloads multiple HDB processes etc. A Discovery Service (section [sec:discovery]) to allow processes to locate each other, and to allow processes to dynamically register availability and push notifications around the system. Housekeeping (section [sec:housekeeping]) to ensure log files are tidied up, tickerplant log files are compressed/moved in a timely fashion etc. This script should form the basis of a production kdb+ environment. If sourcing from another script there are hooks to modify and extend the usage information as required. We have added functionality to find functions or variables defined in the session, and also to search function definitions. name                | vartype   namespace public descrip              ..
maxs                | function  .q        1      ""                   ..
mmax                | function  .q        1      ""                   ..
.clients.MAXIDLE    | variable  .clients  0      ""                   ..
.access.MAXSIZE     | variable  .access   0      ""                   ..
.cache.maxsize      | variable  .cache    1      "The maximum size in ..
.cache.maxindividual| variable  .cache    1      "The maximum size in ..
max                 | primitive           1      ""                   ..
descrip  | "Find a function/variable/table/view in the current process"
return   | "table of matching elements"
name        | vartype  namespace public descrip                       ..
.api.f      | function .api      1      "Find a function/variable/tabl..
.api.p      | function .api      1      "Find a public function/variab..
.api.u      | function .api      1      "Find a non-standard q public ..
.api.s      | function .api      1      "Search all function definitio..
.api.find   | function .api      1      "Generic method for finding fu..
.api.search | function .api      1      "Generic method for searching ..
.api.add    | function .api      1      "Add a function to the api des..
.api.fullapi| function .api      1      "Return the full function api ..
AquaQ TorQ has been built and tested on the linux and OSX operating systems though as far as we are aware there is nothing that would make this incompatible with Solaris or Windows. It has also been tested with kdb+ 3.1 and 2.8. Please report any incompatibilities with other kdb+ versions or operating systems.